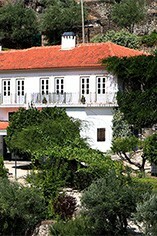 It is not without reason that Fonseca is described as the Margaux of the Douro; its wines have a femininity and grace that never flatter to deceive. The 1997 is a perfect example; combining fresh aromatics and layers of berry fruit flavours with a firm but unobtrusive tannic structure. Enormously concentrated and perfectly balanced, this wine is archetypical Fonseca: proof, if proof were needed, that David Guimaraens has inherited all of his father's legendary winemaking skills. Drink now to 2050. 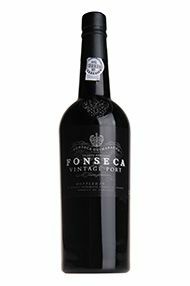 Fonseca is the Dark Lady to Taylor’s Master and Commander, its feminine charm, courtesy of the Panascal vineyard, evidenced throughout its long life and its tannins characteristically silky and rounded. Violets, black tea and cassis dominate the aromas, followed by trademark sweetness and tannic elegance on the palate. There are notes of graphite and herbs mid-palate, just to reassure that one is not to be overwhelmed by the sheer generosity of fruit content. The clean, pure finish provides further reassurance, unnecessarily because by this stage of the tasting one is more than satisfied that this is a top class Fonseca, sui generis and built to last. With a lifted, multi-faceted nose of damsons, black cherries, cassis and violet, this is pure and majestically structured, and oozes aristocratic class. The seamless tannins are beautifully integrated and frame the ripe black fruit perfectly. It is superb, and one for the long haul. 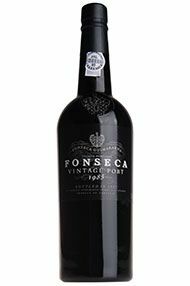 When last tasted in late 2010, the Fonseca 1985 was going through a particularly pleasing phase, indicative perhaps of the overall quality and perhaps somewhat under-rated capacity for longevity of this vintage.The colour is impressive and the rich but elegant fruit character is evidenced, allied, of course, to a leathery spicy gravitas that has evolved through the gentle and suitably sheltered temporal vista of bottle ageing. Youthful, precocious nose of coffee, over-ripe black fruits, raisin and sweet berries.On palate quite spirity, but with very firm tannins, good fleshy weight, characteristic sweetness and plenty of power on the finish. Less finesse than Graham, but singularly attractive and beguiling. 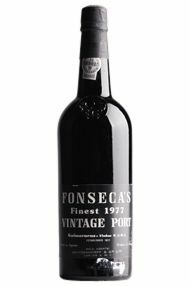 The 2003 Fonseca has a rich, well-defined bouquet of black cherries, aniseed, kirsch and dark chocolate that is heady and seductive. The palate is full-bodied with sweet ripe fig and mulberry notes forming the entry. There is fatness here, a viscosity that coats the mouth, although fortunately there is acidity to keep everything in balance. Warm on the finish, a hint of eau-de-vie lingers after the Port has departed. 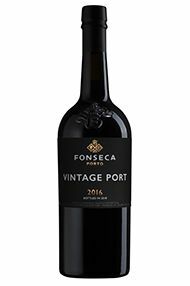 This is a harlot of a Port, but there is nothing wrong with that once in a while – just not every year! Anticipated maturity: 2035-2060. Tasted May 2013. Sporting an opaque, black-colored robe with dark purple trim, the 2003 Fonseca Vintage Port exhibits a nose of profound depth. Its sweet black mass of dark fruit and spice aromas leads to a character of immense depth, richness, and weight. Full-bodied, viscous, and almost impenetrable, this dense, backward port is powerful and exceptionally long in the finish. Possibly the most masculine Fonseca I’ve ever encountered, it coats the taster’s palate with licorice, jammy black fruits, and notes of chocolate that last for over a minute. This blockbuster will require at least three decades to fully blossom. A seductive and powerful nose of damsons, cherries, and blackcurrants leads on to a lusciously sweet palate displaying creamy black fruits with hints of caramel.